"I, Megan of 'Show and Tell Meg' blog and @showandtellmeg on Instagram, sign up as a participant of Me-Made-May '18. 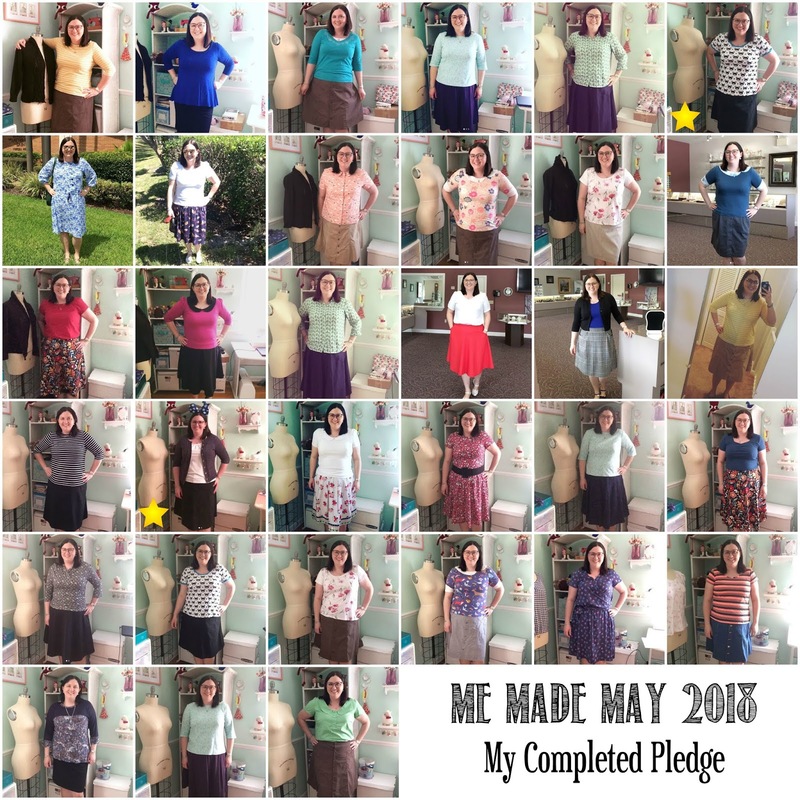 I endeavor to wear at least one Me-Made item each day throughout the month and photograph each day. I also want to finish 2 new clothing items during the month (hopefully more, but we'll see)." Single wears: Gathered Back Top. Sassy Librarian Blouse, Banksia Top, Marianne Top, Retro Boogie Top, Sailor Top, Mimi Blouse, New Look 6150, Sally Skirt, and Peggy Skirt. As far as the other part of my pledge - finishing at least 2 new items - way more than delivered. I finished my Yaletown Dress plus I made 4 new items over Memorial Day weekend! I am kind of shocked myself. My house is officially under contract to sell, and I knew this would be my last real hurrah in my lovely sewing room, so I just kept sewing as long as I could. Now I'm trying to make myself stop so I can pack it up! You will see my 4 new items in the coming weeks on the blog. Another big thing I accomplished is that I went through my entire wardrobe and got rid of about half of it. I have 5 garbage bags ready to go to the thrift store and it's pretty great. I've been carrying things around for years never wearing them, and now I'm finally ready to let it all go. I had a dream a few days ago that I had to go to some kind of fancy Do and I only had the dress I wore to my sister's wedding like 7 years ago that was appropriate, lol, which is true. I had a conversation recently about how there are several fancy items I want to make (and even already have fabric for), but I have absolutely nothing to wear them to, so I never make them. Maybe now is the time I just make something for the joy of it and then I will have it on hand should the need arise. So there really aren't any big revelations from this year's Me Made May, but I've participated so long that I didn't really expect there to be any. I just join in for the challenge and being a part of this fun community. I'll still keep sewing what I want to sew when I want to sew it, and I will keep wearing my favorite patterns over and over, and life will be great :) I'm glad I decided to join in again this year, and I hope everyone had successful challenges!